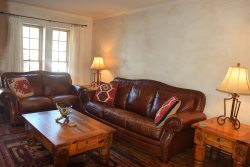 Red River Real Estate and Vacation Rentals - Aspen West 4 Studio, Red River, New Mexico. Sit back and relax.Your mountain adventure is about to begin! The Aspen West Townhouse Complex is home to several Red Riverites and is a great location for anyone eager to see it all. Located near the east end of town, this townhouse is still close to it all. Walking distance to entertainment, shopping, restaurants, nature trail, and fishing. This townhouse can sleep from 4 to 14. The interlocking door allows you to rent just the efficiency (ground level): Queen bed, Twin w/ trundle, 1 bath and full kitchen OR just the top remaining 3 levels: 3 bedrooms with Queen, Queen, 4 Twins, Queen Sleeper, 2 baths, full kitchen, wood-burning fireplace, wash/dryer OR take BOTH!!! Renting both units gets you enough sleeping arrangements for 14 with access to all 4 levels. All 4 levels provides you with 2 entrances: one to the efficiency and one to the upper 3 levels with an interlocking door joining both units. Don't miss out on the balcony on the 3rd level (this level is the common area consisting of full kitchen, 1 bath, living and dining area.) Sit out on the balcony and enjoy a cup of hot cocoa in the cool mountain air! You may be lucky enough to watch a bear stroll by in the early morning. Both of these units provide free WiFi for guests to enjoy during their stay. Not sure of what fun you can expect while visiting Red River? Visit the Community House: free to all who visit! They provide over 400 free activities throughout the summer months. Things like group hiking, smores', line dancing, movies in the mountains, and "Chill". OR visit the Visitor Center for an array of literature about hiking trails, ATV trails, dining options, nearby sights to see, and more. AND don't forget to include chairlift rides and mountain-side tubing during the summer months, as well as Skiing and Snowboarding during the winter months..... Way too much to list; just come and see!!!! Red River is such a majestic place. Although it is small--only one mile long and 3 blocks wide -- this place is huge with heart. This is one place you'll always feel at home! That's why folks have been coming here for 30 years and bringing generations that follow the same trend. One queen bed, one twin bed, one twin trundle bed. Walking distance to all Red River attractions including the Copper Chair Lift. Aspen West 4 provides cable, free WiFi, and central heating. Aspen West 4 Studio pet policy: Pet Friendly! They were extremely nice and help full when we added 2 more days to our trip. When the photos show of the rooms was exactly when we got. Thank you! Everyone I talked to during the reservation process and check in were perfossional, friendly and informative. Our stay was over the New Year weekend and while the studio condo is small, it was sufficient for our family of 2 adults and 2 teenagers. The staff worked with us on short notice to secure a place stay during a very busy time, and were all friendly and helpful. The property was clean and had all the basic needs for our stay. The holiday weekend was kinda price, but I would consider staying here again and would recommend it to others.